Congrats to Emi Hart singer/songwriter who was featured in Midweek's entertainment section. Emi is a beautiful singer with a rich voice. She is also a great person with a huge heart. 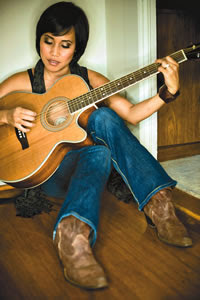 She can sing and play songs written by other artists but writes many of her own unique songs as well. Ask her to write a custom song for you ceremony!! Several of my clients have had the pleasure of her playing at their wedding ceremony. If you are looking of unique singer for your wedding ceremony, Emi is the one! !